The purpose of this study is to investigate the prevalence of pain, pain management, and impact of recent pain on daily functioning in patients with head and neck cancer (HNC) and patients with other cancers. This multi-center survey was conducted by using Brief Pain Inventory questionnaire to evaluate pain status and its impact on daily functioning. A total of 3289 patients were analyzed including 708 HNC patients and 2581 patients with other cancers. The overall pain prevalence was 69.17%. A higher percentage of HNC patients had recent pain (60.59 vs. 44.01%, P < 0.001), required pain management (86.29 vs. 72.03%, P < 0.001), and used any analgesics (53.81 vs. 34.52%, P < 0.001). HNC patients with pain management had a higher prevalence of recent pain (85.83 vs. 81.14%, P = 0.044) and a slightly lower satisfaction rate (74.00 vs. 79.70%, P = 0.070). Regarding the impact of pain on daily functioning, HNC patients had a lower mean interference score for general activity such as walking, normal work, sleep, and life enjoyment. The HNC patients may need more intensive pain management to achieve optimal pain control and maintain daily functioning. The online version of this article ( https://doi.org/10.1007/s00520-018-4404-x) contains supplementary material, which is available to authorized users. This work was supported by the Taiwan Cancer Palliative Care Society and by Janssen Pharmaceuticals, Taiwan. Editorial support in the form of copyediting and manuscript formatting was provided by Cactus Communications and funded by Janssen Taiwan. This study was also supported by a grant from Kaohsiung Medical University Hospital (KMUH103-3M11). S.F.C. and T.C.L. designed the study. K.M.R., Y.Y.S., C.J.Y., M.F.W., J.S.C., C.S.C., Y.M.L., T.J.C., R.K.H., M.Y.L., Y.C.S., K.D.L., P.Y.L., M.S.Y., W.L.H., and T.C.L. collected clinical data. S.F.C. and T.C.L. conducted the database interpretation and statistical analysis. T.C.L. approved of the last version of the manuscript. All the authors read and approved the final manuscript. 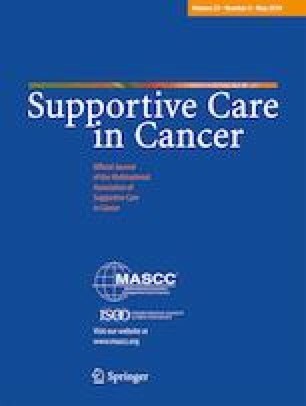 We have read and understood the policy of Supportive Care in Cancer on disclosing conflicts of interest. The authors of this manuscript do not have any financial relationship with the organization that sponsored the research. The authors have full control of all primary data and agree to allow the journal to review study-related data if requested.